The Altelix NP171406 Polycarbonate + ABS NEMA Enclosure is ideal for protecting equipment from harsh environments and tampering. Equipment designed for indoor use can now be located outside. This rugged enclosure is molded from durable UV resistant PC+ABS, a high tech thermoplastic blend of polycarbonate and ABS which combines the best qualities of both into a single material. PC+ABS enclosures are superior to ABS enclosures because they maintain high toughness, durability and dimensional stability even at extreme cold and hot temperatures. 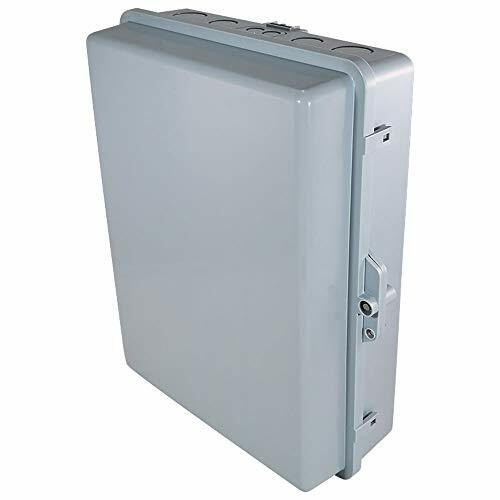 This enclosure is IP55 rated and features a fully gasketed door to protect from dust and water ingress. The door features reinforced hinges, dual latches and a tamper-proof locking screw with key to secure the enclosure. There is also a provision for padlock use. Durable Commercial Grade Polycarbonate + ABS NEMA Box with Reinforced Hinges, Dual Latches, Tamper-Proof Locking Screw and Provision for Padlock. Fully Gasketed Lid and IP55 Rated. UV-Stable and Weather Resistant Rain-Proof Enclosure for Protecting Devices from Tampering, Harsh Environments, Dust and Water Ingress. Inside Space for Equipment Up to 14" x 9" x 4.5" Max. Outside Dimensions: 16.5 x 12.5 x 5.3 Inches. Ideal for Protecting Wi-Fi Equipment, Security and Surveillance Equipment, Concealment of Electronic Devices, Industrial Automation, Warehouses, Public Areas and More.